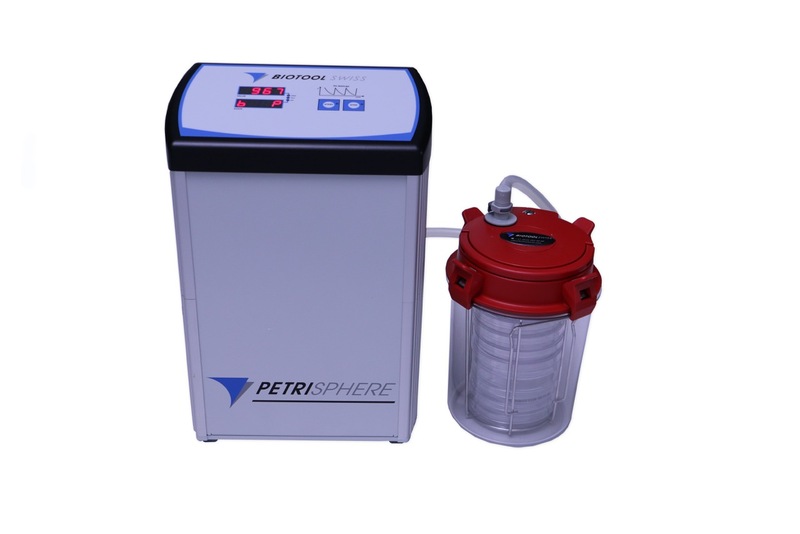 The new Biotool Swiss PetriSphere Gas-System is consisting of a microprocessor-based controller connected with a diaphragm vacuum pump and a nitrogen gas reservoir. The necessary vacuum, the gas exchange pressure and the number of cycles can be programmed at the keypad of the controller. By simply pressing the start button the process starts and runs fully automatic. The container will be evacuated to the pressure adjusted, vented with the reaction gas connected to the system and the pre-programmed number of cycles is processed automatically. No additional chemicals are needed to create an anaerobic atmosphere. The PetriSphere system is cost-saving and easy to use. Special click-connectors provide convenient, safe and time-saving operation. Anaerobic environment: Few structures of organisms can survive exclusively in the deficiency of oxygen (an aerobically). For Examples anaerobic organisms are found in microbes of the genus Clostridium, in parasitic protozoan’s from the gastrointestinal tract of humans and additional vertebrates, and in ciliates connected with sulfide-containing sediments. The Petrisphere allows me to perform experiments under reproducible conditions that would otherwise be prohibitively expensive if run in anaerobic glove box. The machine itself is highly portable and easy to maneuver.